This video is part of the appearance, “Cisco Presents at Tech Field Day Extra at DockerCon EU 17“. 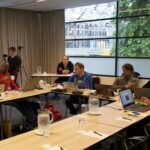 It was recorded as part of Tech Field Day Extra at DockerCon EU 17 at 16:00-18:00 on October 16, 2017. Cisco gives a deeper dive into Cisco UCS and Flexpod integrations with Docker and containers. This includes a look into Docker Enterprise Edition optimizations, and dives into setup and staging questions for deploying these solutions.